Promotional banners are one of the most powerful, low-cost tools for marketing your business. Business banners are lightweight, easy to use, and portable. They’re an economical yet effective way to launch a new business or bring new life to an established one. So, what is the best way to use banners for your business? What type should you buy and where should you display them? The key to successful banner marketing is in the planning. Before you choose what type of banner you want, you need to think about where you’re going to put it. Effective marketers place their banners where they’ll be most effective. Busy traffic intersections are great for attracting a general market, especially if it means that people are seeing your banner every day on their way to work. Studies show that even incidental exposure to advertising helps customers feel more positive about your business. Many community groups choose to use these banners for seasonal or event marketing. They’re also great for new business launches or for reminding customers about established brands. So, if you’re wanting to create brand awareness, durable outdoor banners are a great investment. Shopping districts are also ideal locations for banner placement. When people are shopping they’re already in a buying mood, so they’re more open to marketing suggestions. Pedestrian areas present great opportunities for banners with interactive elements. Invite your audience to learn more, connect through social media, or use QR codes for instant purchases. Describe your target market. Where do they go? What do they do? Find out where your customers go and place banners there for more qualified views and better response rates. Banners are popular at sporting events and major concerts, but if you want your banner to be the focus of attention you need to think about places where people relax or are waiting around. Cafes and school gates can be much better venues and far more cost effective for local businesses. 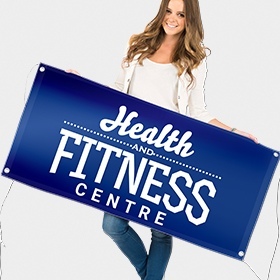 Often complementary businesses and community groups will be happy to host your banner for a small fee. Once you’ve worked out where you’re going to place your banners, you’re well on the way to deciding on the type of banners you need. There are all sorts of banners and flags available for businesses, from the pull-up retractable banner to durable outdoor banners complete with ropes and eyelets. You can hang your banners, set them up on light-weight stands or poke them in the ground. Effective banners attract attention, generate interest, and have a call to action. Your banners should display an image and style that is consistent with the rest of your company’s branding and carry a message that is relevant and appealing to your target audience. Remember that banners aren’t mere decorations, and be sure to include a call to action. Encourage potential customers to make a connection with you. Let them know that you’re interested in their business with an invitation to call, connect on social media, or make an immediate purchase. For more information on how we can help you select the best banner options for your business, please contact our friendly customer happiness team.